What is the difference between walkie talkies and two way radios? This entry was posted on December 4, 2014 by Rick. Recently we received a comment from a customer who took issue with our use of the terms two way radio and walkie talkie in one of our older posts. Apparently the customer was searching for a two way radio but after locating radios listed as walkie talkies, considered it a misdirection to another line of products, presumably perceiving that an item labeled as a walkie talkie was inferior to another item labeled as a two way radio. According to the customer, walkie talkies and two way radios are not the same. In reality, the terms walkie talkie and two way radio are often considered interchangeable, at least here in the US, and are sometimes even used together in the same conversation to reference the same thing. As a US based company, our use of these terms is based on their common accepted usage within our country. These terms may be used differently in other countries, so it is, by no means, an absolute. Of course, there is a difference between a two way radio and a walkie talkie that is somewhat universal. Technically speaking, the two are not the same thing, although in some cases, they can be. To understand the difference, we need to define the terms. A two way radio is a radio that can operate two ways, that is, it has the ability to both transmit and receive a radio signal, as opposed to a radio that can only receive. A two way radio can either operate in a half-duplex or full duplex mode. Half-duplex allows the radio to transmit or receive in turn but not both simultaneously. Full-duplex allows the radio to transmit and receive at the same time. A two way radio is also commonly called a transceiver, because it can both transmit and receive radio communications. In either case, the radio operates two ways; it can send and it can receive. A walkie talkie is a portable two way radio, particularly one that can be held in the hand. This type of radio, also known as a handy talkie, handheld transceiver or HT, allows you to talk on the radio while walking around, hence the name walkie talkie. Now that we've defined the terms, let's consider the argument. Are these terms interchangeable? Well, yes and no. According to the definition, a walkie talkie is a two way radio, but a two way radio is not always a walkie talkie. This is because there are types of radios that are not portable handhelds, such as a mobile radio mounted in a vehicle or a desk or wall mounted base station. But, it can be one. In fact, most, if not all manufacturers of business, CB, consumer, marine and amateur portable handheld radios or walkie talkies do not usually refer to their products as "Walkie Talkies", but as "Two Way Radios". This is understandable, considering the history of the walkie talkie. It originally referred to the portable backpack transceivers used in the military during World War II. More recently it became associated with consumer grade FRS radios. The term has also long been used to refer to extremely low power radios sold as toys and that stigma, while misdirected, still exists today. Given that, it's no wonder some folks shun products labeled as walkie talkies in search of a "real" two way radio. Do you consider walkie talkies and two way radios different or the same things? How and why? It's a great topic and we'd like to know what you think. We will be discussing it in a January 2015 episode of The Two Way Radio Show Podcast and we want your comments. From now until December 31, 2014, for everyone who comments on the topic below, tweets a response @2WayRadios, or posts it on our Facebook or Google + pages, if we read it on the podcast, we will send you a FREE T-shirt! We have plenty of shirts to give away, so send in your comments now. Walkie Talkies offer constant communication without having to connect again and again unlike mobile phones. They are instrumental in saving a lot of time, especially in an industrial setup. People working in a given setup usually do not have a lot of time to connect through calls, so these industrial walkie talkies make communication easier, seeing as all you have to do is press a button and your message will be transmitted across. As director of our shotgun range, I think having 4 walkie talkies. We could have one in the range house and with 2 range safety officers. The range house can easily see field 1 and 2 but field 3 is hidden by two big trees and the poll barn is across from field 3. Field 3(trap/five-stand) and the poll are across the parking lot about 1 block away. 2 uses/reasons? for buying walkie talkies, 1) In case of an emergency on the field 2) Calling a cease fire to field 2 or 2 to three to load the bird houses. What do you recommend? A 4 pack with chargers? If it can receive and transmit radio signal simultaneously at the same time you say in half duflex then it is now consider a telephone and not a 2 way radio.Inever experienced things like that,that by just clicking device,remain clicked you and the other end can remain in continous communication. While reading this my Mom brain kicked in & thought of a way to break it down to a super simple form.... every square (walkie talkie) is a rectangle (two way radio), however not every rectangle (two way radio) is a square (walkie talkie). Thanks, Kat! That is an excellent analogy! My brother has a business and wants to make sure that the security service is working well. It was explained here that a two-way radio can operate two ways to receive and transmit a radio signal. Moreover, it's recommended to go to trusted professionals when considering having a two-way radio. Yes, if you have a more advanced radio they can also tune info FM and AM radio channels, although they probably won't be able to broadcast on those channels. I've seen radios that can access UHF, VHF and FM frequencies although they are quite expensive. This may be a dumb question but I am writing something about a fire lookout in 1950s. Would they be able to listen to radio stations to listen to music on a two way radio set? Can anyone tell me do they make a device (be it a walkie talkie or a 2 way radio or anything else) that can be used primarily indoors, like a mall or shopping center? Good info. I guess separating the terms was natural for me growing up on boats because the two way radio was the fixed device in the boat but the walkie talky was the hand held my dad would take when we would go on shore. They both did the same thing just one was portable and the other fixed. Thanks for this good explanation. Do both, walkie and FRS operate on the same freq>? Is channel 4 the same Freq. on both types? In other words there is no difference. You can make a case that a walkie talkie can be a two way radio but a two way radio can not always be a walkie talkie. 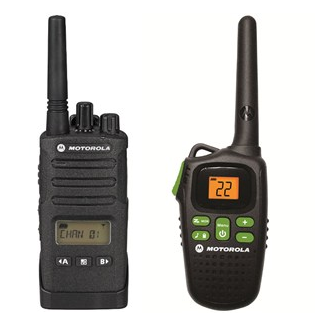 Just the reverse as stated in the article for the simple reason you can always claim your walkie talkie can not only sit on a table or hang on the wall and be a two way radio but you can walk around with it , something you can not do with all two way radios. If a walkie talkie can do half or full duplex then the functions are perfectly interchangeable unless you make the argument that the tow way radio has more power and can reach places the walkie talkie can not in which case the argument can be settled with one simple sentence. Two way had full duplex , walkie talkie does not. But no one mentioned this so I assume it is not the case and there is no real difference. I use the 2 interchangeably, though generally i refer to the walkie talkie in this day and age as a fully fledged hand held version of a car or house mounted unit. I have 2 hand held 80 channel 5 watt UHF cb walkie talkies and 1 car mounted version 80 channel UHF 5 watt unit.. All three have same channels and power output though the only differences are 1/ the battery life in hand held is shorter than the car mounted cb and the range will vary due to size of aerial. All 3 have simplex, and have duplex on the 1-8/31-38 range as well as 41-48 / 71-78 channel range. Growing up the walkie talkies were the little low powered .2 watt 1 channel things but now the definition has changed for me. Good article but a bit confusing. These definitions should be left to the FCC as there are legalities involved. While some two way radios can be tuned to communicate with an frs or gmrs radio it would be illegal to do so, even with a ham license. It would also be illegal to communicate on a gmrs radio without a special FCC license. My definition of a walkie-talkie is a low power two-way radio that anybody of any age can use without a license. All other two-way radios are generally higher power for longer distances and require some kind of license - except in emergencies. Thanks for explaining the difference between two way radios and walkie-talkies. I had a cheap walkie-talkie set as a kid that I used with my friends and we loved. Because of that, I understand that people would avoid anything labeled as a walkie-talkie because of the stigma if they are looking for a "real" tool. Do you know the difference between a two-way radio and a handset? Thanks for the info! I've always thought of a walkie talkie as having one or to channels and a two way radios as being able to adjust to any freq. I've always interchanged the two terms in my own mind and conversations. However, reading this article helps me understand a bit more about how a walkie talkie is not quite the same thing as a two way radio. I guess I'll have to be more specific on my Christmas list this year!